Former Patriots’ special teams standout Johnson Bademosi has agreed to a two-year, $6.25MM deal with the Texans, Adam Schefter of ESPN.com tweets. The new deal makes him the highest-paid special teams player in the NFL. 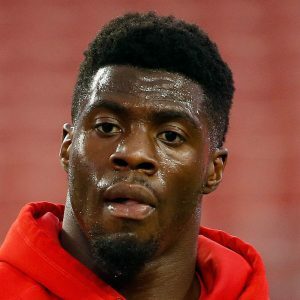 Bademosi was traded from the Lions to the Patriots last September in a deal that netted Detroit a 2019 sixth-round pick. By allowing Bademosi to walk, the Patriots figure to recoup some draft capital. Bademosi is the Pats’ fifth compensatory free agent to depart, which should improve their draw in 2019. Bademosi, 28 in July, could also see some time at cornerback for Houston. He made six starts at CB over the last two seasons. The Texans made two moves of note in the secondary this week by adding Aaron Colvin and re-signing Johnathan Joseph. Meanwhile, safety Marcus Gilchrist left to sign with the Raiders. The Patriots have agreed to acquire defensive back Johnson Bademosi from the Lions, tweets Dave Birkett of the Detroit Free Press. Detroit will pick up New England’s 2019 sixth-round pick, per Adam Schefter of ESPN.com (Twitter link). Badedmosi, 27, started the first three games of his career in 2016, as he’s been mostly a reserve and special teamer through five NFL seasons. In 2016, Bademosi played on roughly a quarter of Detroit’s defensive snaps but saw action on more than half the club’s special teams plays. He’s entering the final season of a two-year deal and will make $1.3MM in base salary in 2017. The Patriots are typically field one of the league’s best special teams units, so Bademosi will fit in nicely. Last year, New England ranked eighth in special teams DVOA. The Patriots had interest in signing Bademosi before he landed with the Lions last year, tweets Michael Lomardi of the Ringer. 6:05pm: Bademosi’s deal ranks as one of the highest accords for special-teamers, with the Lions agreeing to pay the fifth-year defender $4.5MM over two years, with unspecified incentives potentially escalating that to $6MM, Schefter tweets. 5:31pm: Another player will be departing Cleveland in a fast-paced week for Browns exits, with the Lions reaching an agreement with Johnson Bademosi, according to Adam Schefter of ESPN.com (on Twitter). A defensive back and top special-teamer for the Browns, Bademosi agreed to terms with Detroit on a two-year deal. After arriving from Stanford as a UDFA, Bademosi played in 62 games for the Browns from 2012-15, starting none. The Browns have now lost Mitchell Schwartz, Alex Mack, Tashaun Gipson, Travis Benjamin and Bademosi in barely a day. The Dallas Police Department obtained medical records for Colleen Crowley this week as part of the criminal investigation into whether Johnny Manziel assaulted her, according to ESPN.com’s Pat McManamon. Crowley filed a complaint weeks ago alleging that the Browns quarterback assaulted her and ruptured her eardrum. In Texas, causing serious injury could be considered aggravated assault, which is a felony. According to a source, as of one week ago, Crowley could not hear out of her left ear. Browns defensive coordinator Ray Horton said that he left the Titans to be with new coach Hue Jackson and also said that he fell in love with Cleveland and its fans, as Nate Ulrich of the Akron Beacon-Journal tweets. If not for that, Horton says he could have stayed in Tennessee. Horton said the Browns have to give outside linebacker Paul Kruger help on the opposite side (Twitter link via Ulrich). Browns special teams coordinator Chris Tabor made it clear that the team wants wide receiver Travis Benjamin and safety Johnson Bademosi back, as Ulrich tweets. Tony Grossi of ESPNCleveland.com (on Twitter) “wouldn’t be surprised” if the Browns lock Benjamin up to a new deal very soon. Benjamin said in December that was about 75% or 80% of the way to reaching a new deal with the Browns. Browns associate head coach (offense) Pep Hamilton said the staff hasn’t discussed possibility of having wide receiver Josh Gordon on the team next season, Ulrich tweets. Howard Balzer of the SportsXchange (all Twitter links) passes along word on a number of exclusive rights and restricted free agents who officially signed their contract tenders today. According to Balzer, the following players are now under contract for the 2015 season: Browns linebacker Craig Robertson (second-round RFA), Browns safety Johnson Bademosi (low-end RFA), Steelers fullback Will Johnson (low-end RFA), Giants cornerback Chandler Fenner (ERFA), Ravens cornerback Tramain Jacobs (ERFA), and Chiefs wide receivers Frankie Hammond and Junior Hemingway (ERFAs). The Seahawks have re-signed free agent center Lemuel Jeanpierre, according to Balzer (via Twitter). Jeanpierre, who turns 28 next month, started three games at center for Seattle near the end of the 2014 regular season. The Titans have reached an agreement on a one-year contract with linebacker Kaelin Burnett, the club announced today (Twitter link). Burnett, who started his career with the Raiders, has played in 22 total NFL games, including five last year for the Titans, primarily as a special teamer. Wide receiver Kamar Aiken signed his exclusive rights free agent tender with the Ravens today, tweets Aaron Wilson of the Baltimore Sun. The move was a mere formality, allowing Aiken to participate in the club’s offseason program. Lions wide receiver and kick returner Jeremy Ross also signed his ERFA tender today, per Tim Twentyman of DetroitLions.com (Twitter link). Like Aiken, Ross was technically a free agent but wasn’t able to negotiate with any team besides Detroit. The Packers have informed running back DuJuan Harris they will not extend him an exclusive rights tender, Tom Silverstein of the Journal Sentinel tweets. The Ravens are expected to assign an exclusive-rights free agent tender to running back Fitzgerald Toussaint, Aaron Wilson of The Baltimore Sun tweets. The Steelers have offered one-year deals to restricted free agents Antwon Blake, Will Johnson, and Robert Golden, Scott Brown of ESPN tweets. All three will get the lower tender, according to Ed Bouchette of the Pittsburgh Post-Gazette (on Twitter). The Cardinals announced they’ve re-signed Alameda Ta’amu to a one-year contract, as Mike Jurecki of FOX Sports tweets. The Cards decided not to tender him but they have retained him at a lower salary. The 49ers will restructure their deal with safety Craig Dahl, according to Aaron Wilson of The Baltimore Sun (on Twitter). It’s now a one-year, $1.3MM deal with a $200K signing bonus, a $175K roster bonus, and a $50K workout bonus. The Buccaneers announced that they have re-signed defensive ends Larry English and Lawrence Sidbury, tight end Luke Stocker and linebacker Jason Williams. The Ravens have assigned a $510K exclusive rights tender to offensive lineman Ryan Jensen, a source tells Aaron Wilson of The Baltimore Sun (on Twitter). Wilson (link) also hears that the Ravens have given wide receiver Kamar Aiken a $585K exclusive rights tender. The Ravens gave cornerback Tramain Jacobs a $510K tender, per Wilson (link). The Bills announced that they have extended the contract of kicker Jordan Gay, according to ESPN.com’s Mike Rodak (via Twitter). The Browns announced that they have tendered qualifying offers to four of their restricted free agents: free safety Tashaun Gipson, defensive back Johnson Bademosi, defensive lineman Ishmaa’ily Kitchen, and linebacker Craig Robertson, Nate Ulrich of the Akron Beacon-Journal tweets. It’s a second-round tender for Robertson, according to Mary Kay Cabot of The Plain Dealer (on Twitter). Gipson also gets the second-round tender, according to Ulrich (link). The Ravens have sent a second-round restricted tender $2.356MM to Pro Bowl kicker Justin Tucker, a source tells Aaron Wilson of The Baltimore Sun (on Twitter). The Steelers announced that they have agreed to terms with veteran tight end Matt Spaeth on a two-year deal. The 31-year-old appeared in 15 regular-season games in 2014 (eight starts) and caught three passes for 46 yards and a touchdown, and also started the Steelers’ playoff game against Baltimore. The Buccaneers are not expected to tender an offer to fullback Jorvorskie Lane, Greg Auman of the Tampa Bay Times tweets. They could bring Lane, an ERFA, back on a different deal later, however. Lane had a tough year in 2014. He was hit with a two-game suspension for violating the league’s policy on performance enhancing substances in October and his season ended in November after he underwent surgery on his injured right leg. The Broncos have placed the low-level contract tender on restricted free agent defensive back Tony Carter, extending him a one-year offer worth $1.542MM, per Mike Klis of the Denver Post. The move gives Denver the right to match any offer sheet Carter signs with another team, and according to Ian Rapoport of NFL.com (Twitter link), there may be strong outside interest. The Cowboys have placed one-year tenders of $1.542MM each on restricted free agent punter Chris Jones and restricted free agent running back Lance Dunbar, sources tell Brandon George of The Dallas Morning News. Dunbar is the Cowboys’ third running back and tendering him gives Dallas some insurance if DeMarco Murray signs with another team in free agency. He also gives them a reserve back in the event that they have to cut ties with Joseph Randle. The Browns announced that they have re-signed offensive lineman Ryan Seymour. Seymour, 25, appeared in 11 games during the 2014 season, starting three at center. Nick McDonald was originally the team’s choice at center after Alex Mack went down with a broken leg, but Seymour eventually got his chance at the job. The Panthers have re-signed wide receiver/kick returner Brenton Bersin to a one-year deal, a source tells Joe Person of the Charlotte Observer (via Twitter). Bersin was an exclusive rights free agent. The Panthers announced that they re-signed Fozzy Whittaker on a two-year deal, according to Person (on Twitter). The tailback had 32 carries for 145 yards last season and also contributed on kick returns. Linebacker Ben Jacobs and center Brian Folkerts got one-year deals to remain in Carolina (link). Tackle Kevin Hughes is the only Panthers ERFA who wasn’t tendered an offer (link).